Micrograph of an osteosarcoma, a malignant primary bone tumor. A bone tumor (also spelled bone tumour) is a neoplastic growth of tissue in bone. Abnormal growths found in the bone can be either benign (noncancerous) or malignant (cancerous). X-ray of a giant cell bone tumor in the head of the 4th metacarpal of the left hand. While malignant fibrous histiocytoma (MFH) - now generally called "pleomorphic undifferentiated sarcoma" - primary in bone is known to occur occasionally, current paradigms tend to consider MFH a "wastebasket" diagnosis, and the current trend is toward using specialized studies (i.e. genetic and immunohistochemical tests) to classify these undifferentiated tumors into other tumor classes. Multiple myeloma is a hematologic cancer, originating in the bone marrow, which also frequently presents as one or more bone lesions. Chemotherapy and radiotherapy are effective in some tumors (such as Ewing's sarcoma) but less so in others (such as chondrosarcoma). There are a variety of chemotherapy treatment protocols for bone tumors. The protocol with the best reported survival in children and adults is an intra-arterial protocol where tumor response is tracked by serial arteriogram. When tumor response has reached >90% necrosis surgical intervention is planned. The other surgery is called Van Nes rotation or rotationplasty which is a form of amputation, in which the patient's foot is turned upwards in a 180 degree turn and the upturned foot is used as a knee. Over the past two decades, CT guided radiofrequency ablation has emerged as a less invasive alternative to surgical resection in the care of benign bone tumors, most notably osteoid osteomas. In this technique, which can be performed under conscious sedation, a RF probe is introduced into the tumor nidus through a cannulated needle under CT guidance and heat is applied locally to destroy tumor cells. Since the procedure was first introduced for the treatment of osteoid osteomas in the early 1990s, it has been shown in numerous studies to be less invasive and expensive, to result in less bone destruction and to have equivalent safety and efficacy to surgical techniques, with 66 to 96% of patients reporting freedom from symptoms. While initial success rates with RFA are high, symptom recurrence after RFA treatment has been reported, with some studies demonstrating a recurrence rate similar to that of surgical treatment. Thermal ablation techniques are also increasingly being used in the palliative treatment of painful metastatic bone disease. Currently, external beam radiation therapy is the standard of care for patients with localized bone pain due to metastatic disease. Although the majority of patients experience complete or partial relief of pain following radiation therapy, the effect is not immediate and has been shown in some studies to be transient in more than half of patients. For patients who are not eligible or do not respond to traditional therapies ( i.e. radiation therapy, chemotherapy, palliative surgery, bisphosphonates or analgesic medications), thermal ablation techniques have been explored as alternatives for pain reduction. Several multi-center clinical trials studying the efficacy of RFA in the treatment of moderate to severe pain in patients with metastatic bone disease have shown significant decreases in patient reported pain after treatment. These studies are limited however to patients with one or two metastatic sites; pain from multiple tumors can be difficult to localize for directed therapy. More recently, cryoablation has also been explored as a potentially effective alternative as the area of destruction created by this technique can be monitored more effectively by CT than RFA, a potential advantage when treating tumors adjacent to critical structures. ↑ "SEER Stat Fact Sheets: Bone and Joint Cancer". NCI. Retrieved 18 June 2014. ↑ Jeon DG, Song WS, Kong CB, Kim JR, Lee SY. 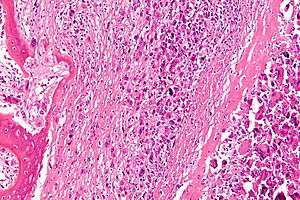 MFH of Bone and Osteosarcoma Show Similar Survival and Chemosensitivity. Clin Orthop Rel Res 469;584-90. ↑ "Questions and Answers about Bone Cancer" (PDF). Centers for Disease Control and Prevention. Retrieved 18 April 2012. ↑ "FDA ANDA Generic Drug Approvals". Food and Drug Administration. ↑ Rosenthal, D I; Alexander, A; Rosenberg, A E; Springfield, D (1992-04-01). "Ablation of osteoid osteomas with a percutaneously placed electrode: a new procedure.". Radiology. 183 (1): 29–33. doi:10.1148/radiology.183.1.1549690. ISSN 0033-8419. ↑ Rimondi, Eugenio; Mavrogenis, Andreas F.; Rossi, Giuseppe; Ciminari, Rosanna; Malaguti, Cristina; Tranfaglia, Cristina; Vanel, Daniel; Ruggieri, Pietro (2011-08-14). "Radiofrequency ablation for non-spinal osteoid osteomas in 557 patients". European Radiology. 22 (1): 181–188. doi:10.1007/s00330-011-2240-1. ISSN 0938-7994. ↑ Rosenthal, Daniel I.; Hornicek, Francis J.; Torriani, Martin; Gebhardt, Mark C.; Mankin, Henry J. (2003-10-01). "Osteoid Osteoma: Percutaneous Treatment with Radiofrequency Energy". Radiology. 229 (1): 171–175. doi:10.1148/radiol.2291021053. ISSN 0033-8419. ↑ Weber, Marc-André; Sprengel, Simon David; Omlor, Georg W.; Lehner, Burkhard; Wiedenhöfer, Bernd; Kauczor, Hans-Ulrich; Rehnitz, Christoph (2015-04-25). "Clinical long-term outcome, technical success, and cost analysis of radiofrequency ablation for the treatment of osteoblastomas and spinal osteoid osteomas in comparison to open surgical resection". Skeletal Radiology. 44 (7): 981–993. doi:10.1007/s00256-015-2139-z. ISSN 0364-2348. ↑ Rosenthal, Daniel I.; Hornicek, Francis J.; Wolfe, Michael W.; Jennings, L. Candace; Gebhardt, Mark C.; Mankin, Henry J. (1998-06-01). "Percutaneous Radiofrequency Coagulation of Osteoid Osteoma Compared with Operative Treatment*". J Bone Joint Surg Am. 80 (6): 815–21. ISSN 0021-9355. PMID 9655099. ↑ Tong, Daphne; Gillick, Laurence; Hendrickson, Frank R. (1982-09-01). "The palliation of symptomatic osseous metastases final results of the study by the radiation therapy oncology group". Cancer. 50 (5): 893–899. doi:10.1002/1097-0142(19820901)50:53.0.CO;2-Y. ISSN 1097-0142. ↑ Dupuy, Damian E.; Liu, Dawei; Hartfeil, Donna; Hanna, Lucy; Blume, Jeffrey D.; Ahrar, Kamran; Lopez, Robert; Safran, Howard; DiPetrillo, Thomas (2010-02-15). "Percutaneous radiofrequency ablation of painful osseous metastases". Cancer. 116 (4): 989–997. doi:10.1002/cncr.24837. ISSN 1097-0142. PMC 2819592 . PMID 20041484. ↑ Goetz, Matthew P.; Callstrom, Matthew R.; Charboneau, J. William; Farrell, Michael A.; Maus, Timothy P.; Welch, Timothy J.; Wong, Gilbert Y.; Sloan, Jeff A.; Novotny, Paul J. (2004-01-15). "Percutaneous Image-Guided Radiofrequency Ablation of Painful Metastases Involving Bone: A Multicenter Study". Journal of Clinical Oncology. 22 (2): 300–306. doi:10.1200/JCO.2004.03.097. ISSN 0732-183X. PMID 14722039. ↑ Callstrom, Matthew R.; Dupuy, Damian E.; Solomon, Stephen B.; Beres, Robert A.; Littrup, Peter J.; Davis, Kirkland W.; Paz-Fumagalli, Ricardo; Hoffman, Cheryl; Atwell, Thomas D. (2013-03-01). "Percutaneous image-guided cryoablation of painful metastases involving bone". Cancer. 119 (5): 1033–1041. doi:10.1002/cncr.27793. ISSN 1097-0142.